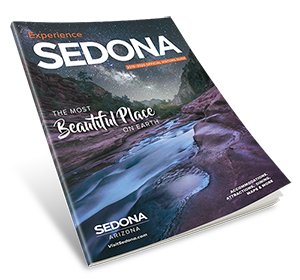 Stay on top of what's happening in Sedona. View our annual events page to find out about our top signature events. There’s never a shortage of things to do in Sedona. The possibilities are as wide-ranging as any international tourist destination. Sedona is an outdoor playground without parallel. It is also a renowned arts community, a global wellness center, and is known for its thriving dining scene. Beyond these activities, special events also occur throughout the year. Every month brings an array of Sedona events. They range from family-friendly holiday gatherings to wine and beer tastings. There are concerts and cook-offs, marathons and spiritual gatherings, conferences on health and open art studio tours. There are festivals that celebrate hummingbirds, plein air painters, food trucks, mountain bikers, vintage aircraft, the human brain, the seasons and more. It’s the kind of diverse assortment of festivities one would expect from a town as multi-faceted as Sedona. There are afternoon events, weekend events and others that go for days. The Sedona International Film Festival, for example, lasts more than a week and has become one of the most prestigious in the country. Visitors can improve their yoga techniques, listen to music, admire artwork, raise their consciousness, or light luminarias. It just depends on what Sedona event they attend. The events calendar will help you keep up with all the current happenings around town. Plan your Sedona visit to coincide with the special event that intrigues you. Don’t be surprised when you peruse the calendar, if you find more than one. No problem. That just means you’ll have to plan multiple trips to the red rock country of Sedona in the coming year.